You can find all the previous Friday the 13th posts on our club page. And for the future, The New Blood will be April 13, 2018, and Jason Takes Manhattan will be July 13, 2018. Ah yes, the old Dr Frankenstein followed by the Temple of Doom. Ok I just finished it and I am not sure that I ever saw this one before. Of course it was so similar to others that it is possible I watched it several times and the details all just ran together. But, the thing is that the movie really isn't that bad. I mean it is really, really, tremendously bad, but it is exactly what I expect from a Friday the 13th movie. In addition, the way it plays out is like a series of barely connected vignettes where Jason kills a couple people in each, which makes it pretty fun to watch. Oh, and let me just say that having an undying monster chained just below the surface of a lake where you can't see him ranks pretty high on the list of ideas that keep me up at night, so, yeah, not bad. 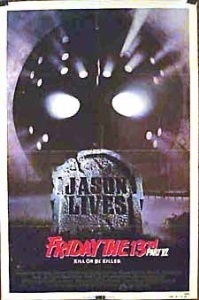 This was the first of the series that I was aware of when it was brand-new...I remember seeing the teaser trailer -- where Jason's tombstone is struck by lightning and explodes, I think? -- in the theater. Not sure what I was seeing at 8 years old that would have a trailer for this movie, but whatever. Is this the one with the James Bond titles? That was fantastic.